September 14, 2017, 10:42 a.m.
One of the many issues still to be nailed down in the Brexit negotiations is the amount of money the UK has to pay to settle outstanding EU spending commitments agreed while it was still a member. Otherwise known in common parlance the "Brexit divorce bill". A few weeks ago the Guardian published a poll showing 41% of people thought a payment of £10bn would be acceptable, which was compared to a previous poll in April when only 15% of people had thought the same. This looked like a stunning change, but as ICM and the Guardian explained, this might because the questions had offered different options - in August £10bn was the lowest amount they asked about, but in April they had also asked about a £3bn sum. Perhaps £10bn was seen as more palatable because it was the smallest amount on offer. 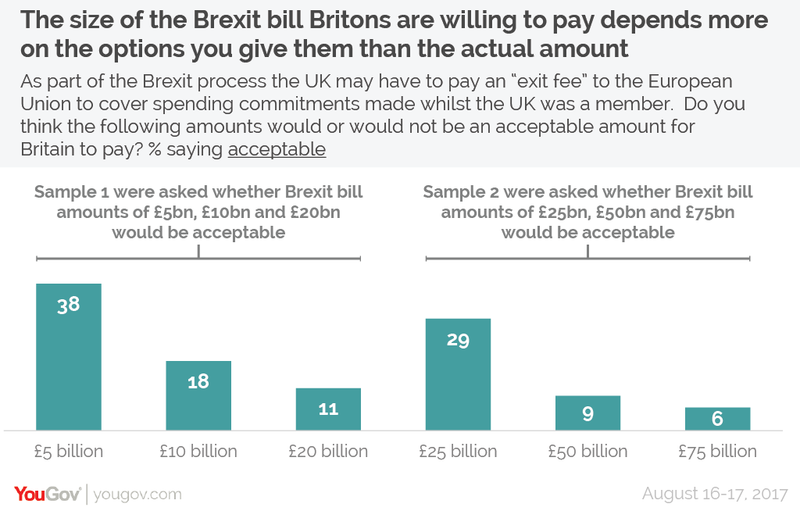 However, looking at the second group 29% told us that a payment of £25bn would be acceptable, giving the rather perverse impression that the British public would find a £25bn payment far more acceptable than a payment of £20bn. As people speculated after the Guardian poll, the explanation appears to be down to the context of the question. By any ordinary standards these are all unfathomably huge sums and most people don&apos;t really have any good yardstick to judge whether £5bn, £25bn or £75bn are good deals or not. But rather than say don&apos;t know, respondents take their cues from the question itself. In the first question £5bn was the lowest deal offered, £20bn was the highest deal offered, and many respondents would have taken away the implication that £5bn was a low settlement, £20 a high one. In the second version of the question £25bn was the lowest deal offered and £75bn the highest deal, creating the contrasting implication that £25bn was a low settlement. 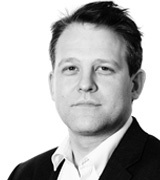 The absolute size of the sum wasn&apos;t totally irrelevant (people did, after all, find the middle option more appealing when it was £10bn than when it was £50bn), but it looks as if it made far more difference whether the amount we asked amount was the small, medium or large option out of those displayed. This is an instructive lesson about the limits of opinion polls when the people responding to them don&apos;t really have any firm existing views on a topic. But what, if anything, can it tell us about how any “Brexit divorce bill" will play out? I think the most important implication is that the absolute number probably doesn&apos;t matter that much, and that questions asking about specific numbers are a bit of a waste of time at this point. *Any* of these numbers will seem like a huge sum of money for Britain to have to give to the European Union. What will matter is expectation management and the context around it, and whether the media and the politicians present the number that is eventually negotiated as being a good bargain the country has struck or an outrageous demand the UK has given into.